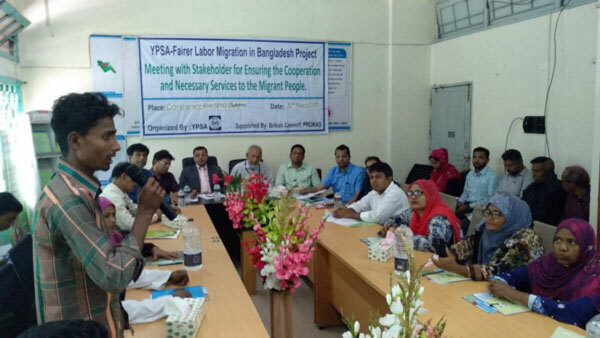 For strengthening the coordination between the service providers and service receivers of migration actors, YPSA organized a stakeholders meeting at DEMO (District Employment and Manpower Office), Chattogram on 31 March 2019. This meeting was a process of being accountable of migration service providers to service receivers. At the meeting, service providers were asking several questions to service providers and service providers gave answers to that questions. The objective of the meeting is to create a linkage between service providers and receivers in migration arena. TTC’s has shared government has taken initiatives to decentralize the services of TTC’s. Total 437 TTC’s will be established at entire Bangladesh. In first phase 90 TTC’s will be launched at entire Bangladesh where 06 TTC’s are in Chattogram. In addition to by this year two TTC’s will be launched in Chattogram, one is in Sandwip and another is Rauzan. Government also taken decision on increasing the duration of pre-departure training of male migrants and it will be now 06 days which will be residential. DEMO has shared that BMET has been conducting public hearing in weekly basis to address the problem in migration. 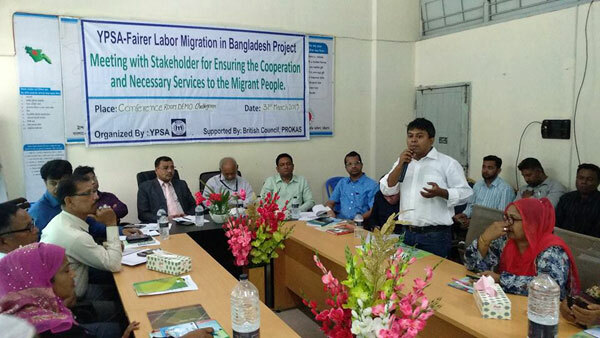 There are about 30 labour wings in Bangladesh mission abroad where they are working for aspirant migrant’s welfare. DEMO facilitates to migrants on filling up the embarkation card at airport. In addition to DEMO has been providing necessary supports to migrants in properly and regularly. If anybody face any difficulties in this regard then fell free to inform DEMO. Mr. Abu Noman Md. Zakir Hossain, Deputy Director, Divisional Passport and Visa Office, Chattogram is sharing the services of Passport Office and given answer the questions of participants. The meeting has started with the greetings speech of Md. Mahabubur Rahman, Director, YPSA. He gave thanks and expressed gratitude to all participants for attending this meeting. He said, “This is the first meeting in Chattogram where all relevant actors of migration were participated”. Md. Abdus Sabur is presenting the labour migration scenario and project experiences. Afterwards, Md. 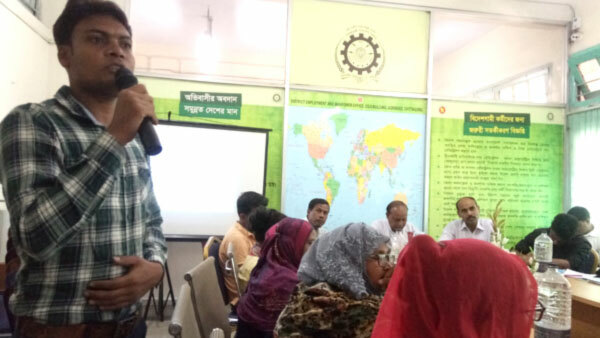 Abdus Sabur, Program Manager has given a multimedia presentation on labour migration scenario of Bangladesh as well as the outcomes of Fair Labour Migration Project. He also shared the experiences on working labour migration project. Then an aspirant migrant, Mr. Asad has shared his experiences and difficulties on preparing the passport. For instance, he has given extra money to middleman on preparing this passport also taken more time than scheduled time on preparing passport. Mr. Faizullah, Returnee Migrant from Brunei said that he was tortured and detained in Brunei since five month. He was escaped and come in Bangladesh due to the effort of GMC and Bangladeshi Embassy. Now he wants compensation from perpetrator but he scared that the perpetrator threaten him for not disclosing this information to others. On that time Mr. Jahirul Alam Mazumder, DD, DEMO, Chattogram said that if Mr. Faizullah wants justice then DEMO will supports him. Shelina Akter, is sharing her experiences and challenges on working as a Grievance Management Committee (GMC). 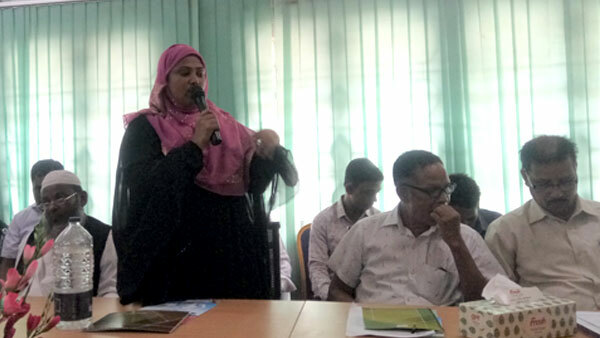 Selina Akter, UP Member, Saraf Bhata Union, Rangunia and GMC member said they are now working on settling the overseas related complain through social mediation. In addition to they make awareness on safe migration and informing the services of migration relevant organizations to aspirant migrant. Shahinur Rahman is presenting the services of Fair Migration Support Centres. 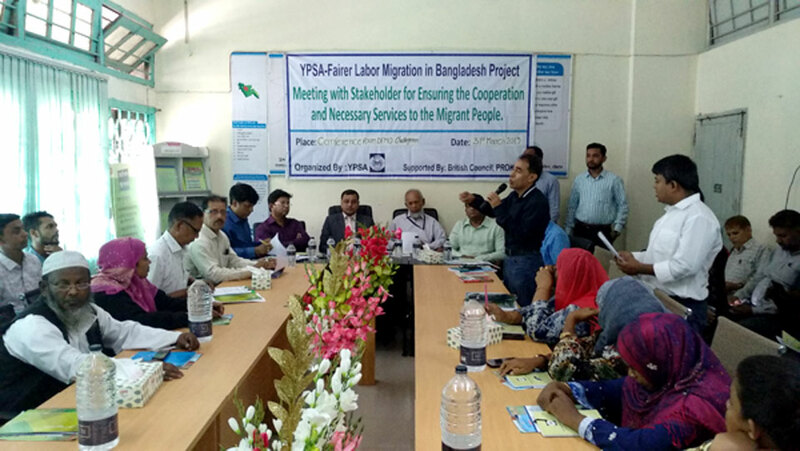 Shahinur Rahman, Field Officer, YPSA-FLM has shared the services of Fair Migration Service Centre (FMSC). 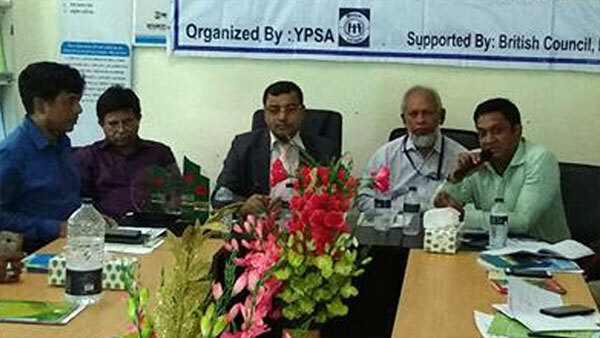 He said YPSA has established Fair Migration Support Centers (FMSC) at Union Parishads. These centers are now disseminating the knowledge of fair migration steps, services of migration organization and receiving oversees related complains. Till now FMSC’s has reached about 1500 aspirant migrants and migrants’ families. 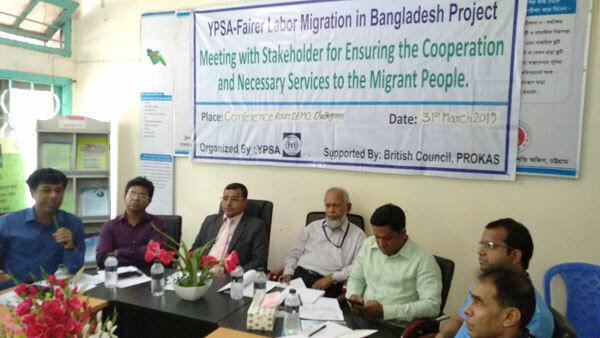 Consequently, communities are informed the available services of migration organization and they are now claims the services to respective organizations. Abdul Hamid is haring his experiences on working as a representatives of RAs. Abdul Hamid, Staff, Fatikchari Overseas (Recruiting Agency) said that generally migrants are going to travel agency for passport, visa and ticket processing. If they come to registered RAs then they will not fall in danger. In addition to the flight delay and breach of recruiter is not fault of RAs. Put an end the government services providers as DEMO, Passport Office, Probashi Kollan Bank, Depart of Information, and TTCs has shared their services and offered if fell free to support then must come and claim the services. In addition to they also agreed to come in community level on sharing the services. Mr. Mohammed JahirulAlamMazumder, Deputy Director, District Employment and Manpower Office (DEMO), Chattogram is sharing the services of DEMO and given answer to the questions of participants. Finally, Mr. Mahabubur Rahman, Director, YPSA has given special thanks to all participants for quality engagements and time and given special thanks to DEMO, Chattogram for supporting of organizing such events. He called for collective action and synergies for facilitating necessary support to migrant and migrant family on ensuring safe, orderly and regular migration.